This is the twelfth post in the Malaysia and Singapore! series. Other posts in this series include Lot 10 Hutong – Kuala Lumpur’s Most Famous Hawker Stalls Under One Roof, LaZat Malaysian Home Cooking, Otak, Otak Fish Dumplings in Banana Leaf, Little Penang Cafe + Visiting the Petronas Twin Towers, Roti Jala – Malaysian Lacy Pancake, Nonya Malaysian Chicken Curry. Bijan, Onde Onde, Jalan Alor -Kuala Lumpur’s Most Famous Food Street, and Walking Food Tour of Kuala Lumpur. One of my favorite parts of joining small, personal tours in Malaysia was the added benefit of having a local friend show me all sorts of things I didn’t even know existed. The “mamak” (the “k” is silent) is a perfect example. Mamaks are casual, open-air, 24-hour restaurants owned by Muslim Indians serving casual comfort food. 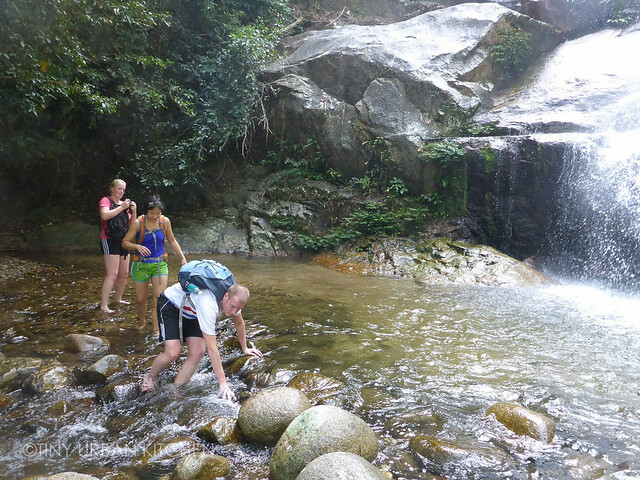 I discovered mamaks when I signed up for a day long hiking trip into the rainforests of Malaysia with Open Sky Unlimited (highly recommended!). Although hiking was the main focus of the tour (and I’ll write a separate post about that experience), one bonus of the trip was the opportunity to visit the same 24-hour mamak twice: once for breakfast and once as famished people who had just completed a strenuous 9-mile hike. Our tour guide’s name was Amos, the owner of the company and the one who personally runs all the tours. He limits his tours to only 4 people, which makes the whole experience much more manageable, intimate, and fun. This tour had three people, a couple from Europe and myself, with Amos as our tour guide. We got up bright and early (hotel pick up at 6:10AM!) and drove about an hour and half out towards the edge of the rainforests. Our first stop: a local mamak that Amos highly recommended. All food was part of the tour, so we just ordered whatever we wanted. I got two drinks: a warm milk tea and a refreshing tart drink made out of a small, slightly bitter and sour lime-like fruit called calamansi or limau kasturi. For breakfast, Amos just ordered us a bunch of different types of roti canai to share. Roti Canai is a stretchy, flat bread that is a signature dish of mamaks. They can be enjoyed either savory or sweet, similar to a European crepe. The one pictured above is filled with eggs, banana, and kaya, a pandan flavored spread. Even though I’m not a banana fan, I thought this filled roti was fantastic. I loved the slightly crispy texture of the edge and the warm, sweet filling on the inside. “Roti just means bread” Amos explained to us. I had always assumed “roti” referred to this specific type of flat bread, but in reality you could be talking about a loaf of white bread and use the same term. The term following “roti” describes the type of bread you are eating. In Malaysia, this stretchy bread is called roti canai (pronounced CHA-NAI), although other regions use different terms. For example, Singaporeans refer to it as roti prata, Indonesians call it roti cane, and Indians call it roti paratha. The savory “empty” roti canai (called kosong which means empty) can be enjoyed with a variety of very flavorful sauces. We tried several, such as Dhal, a mild savory lentil based sauce, a fish curry, and Sambal, a spicy sauce. It was super fun to try the different sauces with the roti canai. Another rice based style is called Tosai Masala, pictured above, which was softer and had less of a stretchy, gluten-filled texture. I personally loved the Tosai Masala, especially because it was filled with potatoes and other flavorful spices. We saw so many interesting, exotic, and unusual things in the forest, there’s no way I could cover them all in this post, so I’ll just give you a teaser but promise to write a follow up post with more details. Yes, I do carry around my huge SLR on hikes, even if it makes me slightly unbalanced. After a rigorous 9-mile hike (which included crossing rivers!) we were ravenous. After all, it was closer to 2PM by the time we finally arrived back at the same mamak stall. Lunch was even more interesting, with a wider variety of dishes I had never seen nor tried. Pictured above is Rojak, a saucy stir fry that consists of chopped up piece of fried dough, hard boiled eggs, peanuts, and various vegetables. The sauce is sweet. savory, and spicy all at the same time. It was really, really good. Nasi Kandar refers to a variety of sauce-like sides that you eat with rice, such as the Lamb + Potato one above. Another nasi kanda, Okra with Curry, was also delicious. A more unusual one would be bitter melon cooked in a fragrant flavorful sauce. Murtabak is a huge omelette stuffed with fried rice and aromatics, like garlic and scallions. It was comfort food at its best. Mie Goreng is essentially ramen stir fried with eggs, Indian fried dough, carrot, scallions, and fried shallots. It’s extremely fragrant, just greasy enough, and super satisfying after a long hike. We sat there, stuffed but extremely satisfied. We had just missed the rain, which was now pouring down in buckets. We could almost feel the drops from our seat in the no-so-protected open air air seating area. We were very thankful for roof over our heads, and we hoped the wind wouldn’t get any stronger. As the thunder and lightning rolled in, we remarked how fortunate we were to have just missed it. To think that just moments ago, we were swimming in the river. I was really sad when the whole day was over. 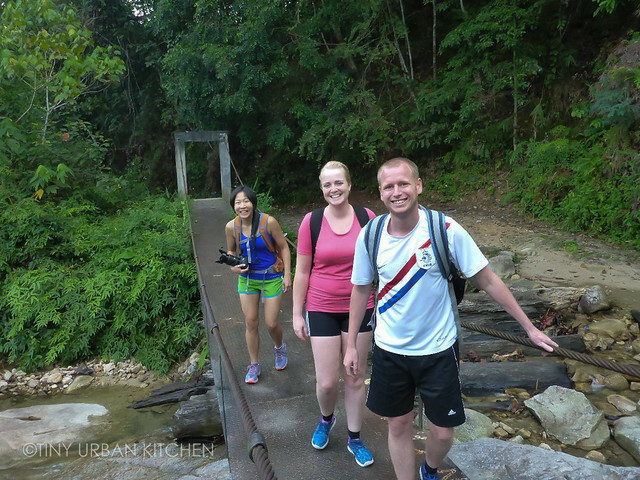 Not only did I have a phenomenal time on the hike, I absolutely loved eating at a mamak and learning about all these local dishes from a local guide. You don’t usually expect food to be such a great part of a hiking tour, but this tour surprised me in more ways than one. Details of the actual hike to come in a future post! Thanks Adrian! 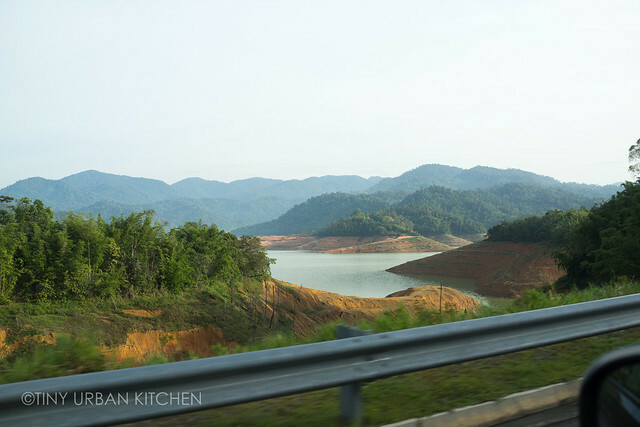 I do love Malaysia and wish i could have visited Penang! Enjoy Tokyo!! No photo of malaysian briyani? Briyani is kinda of food for india. Especially Dum briyani. Malyasian cucken currey and all mamk food are tasty. Tosai is dosa and some places just dosa. Most people like long crispy thin ghee falvored paper dosa. Masala dosa is alright. Best is egg dosa with mutton curry combination.